Unique construction makes these mats safe to use in both wet and dry areas. Resists chemicals, animal fats and petroleum products. 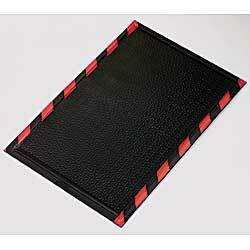 Rubber backing grips the floor, preventing mat movement and increasing safety. Beveled safety edges on all sides. SPECIFY BORDER: BK - Black, GN - Green, OR - Orange, RD - Red, YL - Yellow. FACTORY QUICK SHIPFOB GEORGIA.